※ The photo is a prototype. 2WAY Tyruva reel that can attack with "easy winding" concept and "high speed winding" concept. "Winding" in Tylaba, it is a conversation with the ocean, confronting the target. Hyper digital gear loaded model developed pursuing extreme "winding". 8.6 of a high sensitivity model that even feels a fluttering of a tie. 4.9 of a sushi rolled model that can confront any big snapper with its light and powerful winding. High operability coming from the low profile shape. The super metal housing produces a light and powerful winding that makes you feel a round reel. The elements required for Tyraba are fused at a high level. 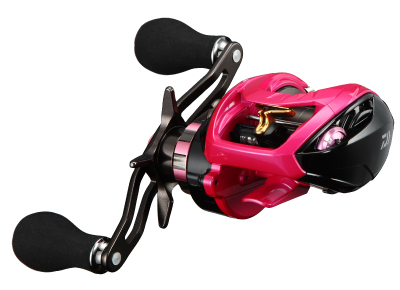 A new generation drag system that keeps on working while smoothly following the fish pull. It is harder to break a line because it is smooth than before, and it is hard to make a fish run unnecessarily because it is hard to give a sense of incompatibility. In addition, there is a unique stickiness in the feeling of operation, even with a low drag setting value runs at a stroke decreasing, the frequency of drag recalibration during fight decreases and you can concentrate on fighting.